It would be fair to say that it has been a while since I have written up a post on Very Berry Cosmo…. and I do feel really horrible about it. We all have our moments though. I have been very very busy with University – but now it is all over, I have completed my degree! Yippeeeee! I thought I would just get straight back into blogging, it’s all I have wanted to do since like September. When I handed in my final piece of coursework a few weeks ago, I thought I would be so motivated and so ecstatic to have finished, which of course I do somewhat feel that way. Stress and tension has been building up to this moment for such a long time, of course it is lovely for that to have been lifted off my shoulders. However, I am very overwhelmed about life after Uni, I am trying to secure a job for myself and I have to move out of my Leeds flat in about a week – I could be working / living anywhere in the next few months – scary thought! Completing my degree doesn’t feel so WOOO and as free as I thought it would, and I’ve just kind of felt demotivated on the blog front because of this. The longer you leave it, the more you don’t want to get back into it. So here I am, typey typey typey-ing away, and if I’m honest, I already feel HEAPS better. I love writing, I love expressing my thoughts and feelings for you strawbs, this is my passion. Why have I been sitting back from this thing I love for so long? They say the more you ‘put off’ doing something, the more anxious you feel, and that anxiety only goes when you GET BACK ON THE HORSE. Anyways…… Excuse the rant, let’s get down with the blog post shall we? There is something that I HAVE been motivated to do, and absolutely loving, is READING. My bedroom currently looks like a Waterstones store, my to read pile is sky high, and what do I keep doing? BUYING MORE BOOKS. BOOKS THAT I DO NOT NEED, BUT HAVE TO HAVE. Now, if any of you know me…. you will know how EXCITED that little sentence above makes me. Of course this book had to immediately come home with me? Lily is someone that I have had the pleasure to talk to on social media, even with her large amount of followers she is still as humble as ever, and a big inspiration to me. Mental health these days seems to be my life. I seek out design related to MH, and I absolutely love all kinds of books under this MH umbrella, whether they are promoting health and wellbeing, or simply somebody sharing their story. You know my love for Matt Haig’s ‘Reasons To Stay Alive‘ and I can’t stop tweeting about how I want to read ‘Mad Girl‘ by Bryony Gordon, and this book by Lily is no exception. Lily opens up quite a lot on her social media about her suffering with OCD, on various chats and online articles. I had always been intrigued by her symptoms and compulsions, I always love hearing about OCD stories that are completely different to mine, maybe I am nosey, or maybe I just want to understand this illness just a little bit more. That’s the thing… there are SO MANY different strands with this disorder, something that I have tried to tackle during my ‘goodbye OCD stigma’ project – thank you for all the support by the way! There has been a lot of sad, and hurtful comments about OCD in the media over the last week, predominately in ‘trash newspapers’ so I am not taking it to heart too much, in regards to the devastating loss of the MP Jo Cox. This whole situation has broken my heart, I feel for her family and children so so much, however it is not right to assume that just because the man may have suffered from OCD, that this was DEFINITELY the reason for his actions. Having a mental health problem doesn’t necessarily mean you are a bad person, or a person that would kill someone. The stereotype saddens me. 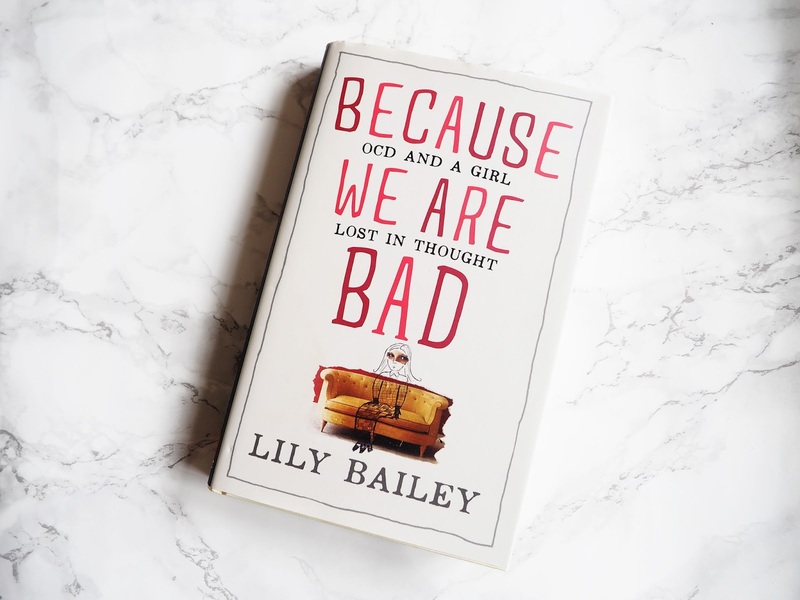 Lily’s book ‘Because We Are Bad‘ helps to break this stigma. Sadly, Lily has been battling the condition for the majority of her life, whereas I am a fairly ‘new sufferer’ of about 3ish years now. This book made me laugh in parts, but it also made me weep and weep and weep, I could just relate so so much. She begins with describing that her OCD feels like she has an imaginary friend inside her head, that never went away, even as she grew up. This imaginary friend of hers wasn’t the typical jolly cuddly type though however, and would say all sorts of nasty things resulting in her acting on compulsions. Before reading this book I thought Lily and I suffered from very different symptoms, this was the case, but we also share a large amount of thought processes and compulsions, particularly of the checking kind. There is something weirdly comforting about someone suffering from the same things as you, it feels great to not be alone, even though I wouldn’t wish anyone to ever have the nasty intrusive thoughts that I have. To the ‘non OCD sufferer’ the thoughts and actions that Lily have might seem really silly, you might wonder why the flip she would ever think them, but to me, I totally understand her. You need to read this book to see what I mean, but you get a good glimpse from the blurb above! Now, don’t be alarmed when reading this… and think OH I DO THAT, AND THAT, because yes, a lot of OCD behaviours and intrusive thoughts themselves are very common, such as checking that you have locked the door multiple times. It is only when these thoughts INTERFERE COMPLETELY with your life, they get in the way and stop you from getting on with your everyday life. If you have any concerns do see a doctor though, I am here to break the stigma and bring more awareness to this condition, because from my previous experience I also know that I had NO IDEA what was going on with my mind and thoughts, and I would have NEVER expected that I had OCD, particularly with how it is spoken about in the media. Does this sound like a book you would like to read? I hadn't heard of this book, but it sounds like a great read! I think if you have suffered with MH it is comforting to hear other's personal story, as even if the symptoms are different, the feelings and anxiety surrounding it are often the same. Congrats on completing your degree lovely! I wish you the best of luck! I'm definitely going to be picking this book up with my next Amazon order! The first few lines just pulls me to buy that book, like most of the people suffering from OCD would say, "That's what I think"
This is definitely a book I want to read. I'm fortunate enough never to have had OCD so although I'm not expecting to relate to it, I'm really interested in getting an insight. I love books about mental health, written from experience as I'm hoping to train as a psychiatrist and would much rather understand things from this point of view than simply from a textbook! I think I need to read this book. I had these issues when I was a kid and these issues has a very detrimental effect on my life, so it would be nice to read a book that shares a personal insight into OCD. Crissa Chappell, who has OCD, wrote a wonderful YA novel on the subject, TOTAL CONSTANT ORDER.